When Sam Van Aken found out that a New York state orchard—with varieties of stone fruit 200 years old—was about to be abandoned in 2008, he bought it to save those species and to experiment: Grafting from the existing trees he created the magical Tree of 40 Fruit, which produces over 40 types of fruit. The Tree of 40 Fruit is an ongoing series of hybridized fruit trees by contemporary artist Sam Van Aken. Each unique Tree of 40 Fruit grows over forty different types of stone fruit including peaches, plums, apricots, nectarines, cherries, and almonds. 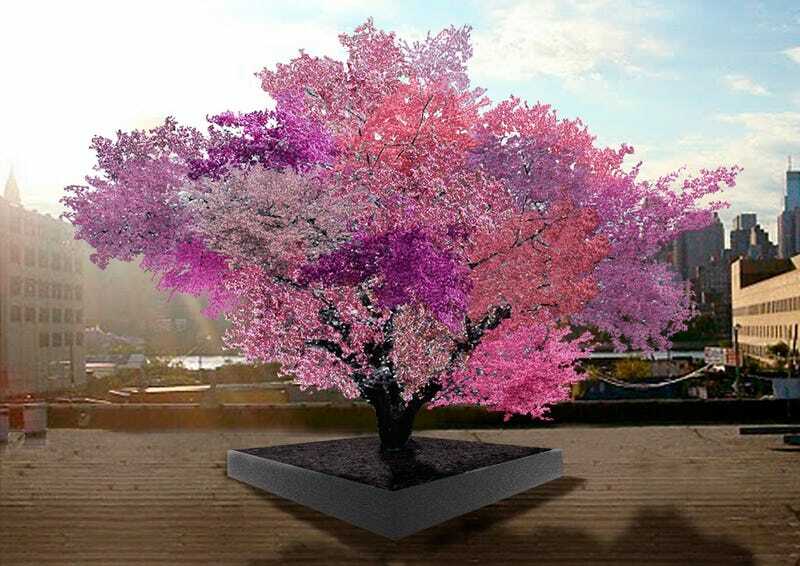 Sculpted through the process of grafting, the Tree of 40 Fruit blossom in variegated tones of pink, crimson and white in spring, and in summer bear a multitude of fruit. Primarily composed of native and antique varieties the Tree of 40 Fruit are a form of conversation, preserving heirloom stone fruit varieties that are not commercially produced or available. Here's Sam talking about his project in TED.